Though I posted last week that I have been failing with aplomb, I have gotten a few things right. One such thing is the creation of the ZeDream Team. Serendipity may have brought each of these amazing people into my life, but their coming together for A.C.E. was by complete design. They were my first choice, and I am so grateful that they signed up to create with this mad scientist and are equally invested in my multimedia experiment. Some pick people to work with whom they know can’t challenge them, can’t do what they do, and would never usurp power and commandeer their operation. They want to stand out, be worshiped, and have no intent on truly collaborating and working together to create something that can only be realised because of amalgam of individuals brought together for the common cause. I have no desire to be the despot. I want to collaborate. This means bringing people in with different skill sets so that we can all enhance each other’s strengths and compensate for each other’s weaknesses. I want to learn and grow through this process and the only way to do that is to surround myself with people who can magnify the areas I need to work on and amplify my positive traits. I in turn hope to be able to do the same. Leadership is not necessarily about being the best, or about dictating to the people you are in charge of. Leadership to me is understanding group dynamics and ensuring that everyone is able to put their best self forward. To know how to create magic with the ingredients each person has to put in the pot. To know how to assign the right tasks to the right person. To know when to rally the troops and when to pull back. To know when to micromanage and when to leave people to autonomously go about their business. Sometimes it means stepping back and letting others lead. 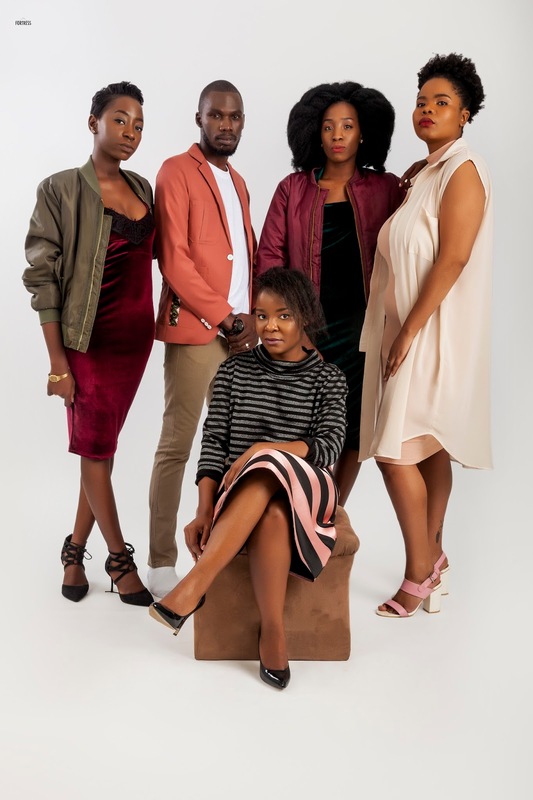 Chosa, Puthumile and the Ladies of Mafashio (Sekayi and Tukiya) all have something in common with me: a desire to create, to push the envelope, to question, and to make our world better a better place with content that engages, informs, entertains and explores new paths. More importantly they are crazy , weird and mysterious in their own unique ways. They have all pleasantly surprised me in some shape or form over the last couple of years. They have made me think about things from different perspectives. They have challenged my ideas and been catalysts to shifts in the way I do things, in the way I see myself and what I have to offer the world. They are the reason A.C.E. exists. I wanted to find a way to bottle all that they have to give and create, to then uncork it in an explosion of creative content across media. Chosa will always keep a cool head, and if he loses his temper it means that things are really bad and we need to get ourselves together. That I will always have a visual eye that gets what is needed to capture A.C.E. points of view in stills and/or video in innovative and singular ways. And when we are editing, we will sink into our easy dance until some sort of rendering, colour correcting or other irritating process will cause me to throw a tantrum as impatience gets the better of me, he will distract me till it is done. Puthumile will bring all the ideas the team has together and distill them into a beautiful river of words that will touch our souls. That she will step in when I cannot get to something, and that she will always be there for me to vent, parse ideas, and to motivate me to keep at it when I am thwarted by my mind, or by things out of my control. She will remind me to keep my eye on the prize and see a new way ahead when I cannot. All the while pretending to be the Thing, made of rock. I won’t tell that she is really the Pillsbury Boy, all cookie dough, love, and rainbows. The ladies of Mafashio come as a pair but if their individual personalities and talents did not fit into A.C.E. I would have only asked the one that contributed positively to the dynamic. Luckily I didn’t have to because their brand is a 2 for 1 special. I always say that once you are Fundafunda-ed you can’t go back. They are part of a creative familial dynasty and if you ever have the privilege of encountering any of their cousins, be prepared for your life to change. These girls bring a youthful effervescence that counters the over 30 jaded outlook that the rest of us have. They also have a refreshing positivity; a lust for life and new experiences that spurs me on. They have a window into a world that is beyond me, and they are nice enough to bring me into it. So long as Chosa, Puthumile and I are not left to our own devices, A.C.E. things happen. When we three meet, things descend swiftly into the silly, the debaucherous and the unfocused as our creative juices flow. We end up having conjured something we have absolutely no means to achieve and depression sets in. Luckily there is usually food to make us feel better. Soon we shall be officially launching with a taste of ZeDream Team’s talent and starting production on our first mini project. I will continue to document the A.C.E. journey on the blog at least once weekly so keep checking in to walk along side us as we re-imagine African storytelling. For a more visual experience follow us on Instagram. If you would like to chat about the project or just to get to know me better, please start a conversation on Twitter. For more on the A.C.E. Project, bookmark the blog, where this article first appeared, and follow it and the ZeDream Team on Instagram.